The dilemma: Sitting for hours on end is horrible for you, and standing desks are expensive as heck. 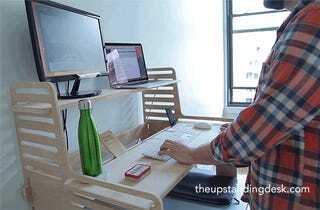 The answer: The UpStanding Desk, a Kickstarter for an inexpensive shelf-like module that turns any surface into an instant standing desk. Magic! The UpStanding Desk has two levels—one for your monitor, and one for your keyboard or laptop. The levels can be adjusted in one-inch increments, and they have room in the back for you to feed all your wires and chargers through. Pledge $200 or more and you'll get a desk sent your way—they're shooting for a June delivery. But smaller donations will get you printable plans so you can cut your own UpStanding Desk.